The example bellow demonstrates how to bind RadGridView to an ObservableCollection. 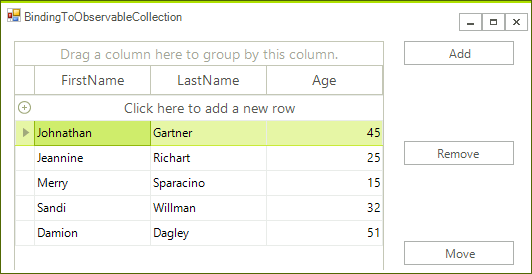 This collection represents a dynamic data collection that provides notification when changes (add, move, remove) occur. 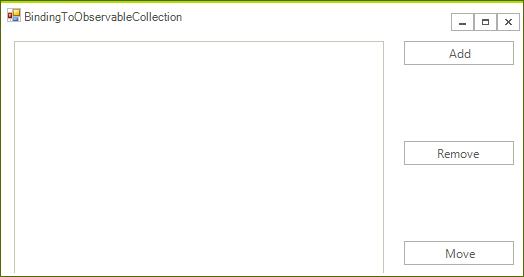 This collection is available in .NET version 4.0 and above. For this reason it is only supported in the .NET4.0 version of our assemblies (the ones with suffix .40), so please make sure to use those in order to take advantage of this functionality. The example creates an ObservableCollection of Person, initializes the collection and assigns it to the grid's DataSource property. There are also three buttons allowing the user to add, remove and move items from and in the collection. The changes in the collection are automatically reflected by the grid. Now each change you introduce to the collection by pressing the buttons will be automatically reflected in RadGridView.